New Delhi: A controversial bill to create Telangana by dividing Andhra Pradesh was passed in the Lok Sabha today amid protests, but live telecast was cut off in an unprecedented blackout. The bill will now be taken up in the Rajya Sabha. Anti-Telangana politicians like Jagan Mohan Reddy have called a shutdown in Andhra Pradesh. Three minutes after Home Minister Sushil Kumar Shinde began the proceedings for discussing and passing the bill, live telecast was cut off. The doors and galleries were sealed. Before the house assembled, Speaker Meira Kumar had met top ministers and Leader of Opposition Sushma Swaraj, and they all reportedly agreed that the Telangana bill must be passed, even with disruptions. The Speaker told NDTV that the telecast was stopped due to a problem. "There was a problem, so we couldn't show the live telecast," she said. The Lok Sabha secretariat later called it a 'technical glitch' but said the media did witness the proceedings from the galleries. The BJP's Sushma Swaraj called it a "tactical glitch.' She said she was not aware that the telecast had been stopped. During her speech on Telangana in the Lok Sabha, some MPs had pointed it out but she continued speaking. Deputy parliamentary affairs minister, Rajiv Shukla, indicated that the blackout may have been planned as he said, "There are provisions for TV cameras to be turned off whenever there are disruptions in the house, when MPs are in the well." "It is daylight murder...the murder of democracy. The Speaker is acting as an agent of the Congress. More than 50% of the house is at the Well. 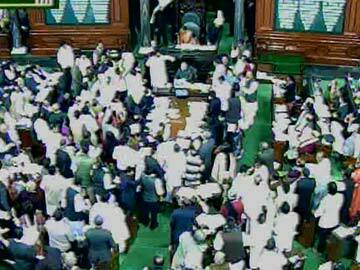 They should have suspended the entire house and passed the bill," said a TDP MP. The Left and the Trinamool reportedly protested inside Lok Sabha over the manner in which the bill is being taken up for passing. "Today democracy has been killed in spirit," said Trinamool member Dinesh Trivedi. Politicians from Seemandhra, the non-Telangana region of Andhra Pradesh, including Chief Minister Kiran Kumar Reddy, oppose the bifurcation; Seemandhra is worried about a smaller share of water, power and revenue from Telangana once the new state is created. The Chief Minister will resign tomorrow, say sources. While celebrations erupted among Telangana supporters, Seemandhra leaders have decided to move petitions in the Supreme Court against the new state. "The way the proceedings took place, it demonstrated how democracy can be killed. We are declaring a bandh in Andhra Pradesh tomorrow," said YSR Congress leader Jagan Mohan Reddy, who has been sitting on protest in Delhi.